An enlargement of a panoramic photograph of Aquia Landing, spring 1863. Standing on the windswept, barren point at Aquia Landing, it’s hard to imagine today that the place (in terms of its significance to non-Indian occupants of the region) was born of technology–the never-ending human quest for increased speed. At Aquia Landing, steamboats first met roads (1815), then a railroad (in 1842)–the Richmond, Fredericksburg and Potomac. The combination of the two cut travel time between Washington and Richmond, compared to the pre-steamboat era, by days. As with many historic places hereabouts, the most vivid lens we have on them is through the Civil War, when thousands wrote of our landscapes and photographers and artists flocked to portray suddenly famous places like Aquia to a national audience anxious to know more. 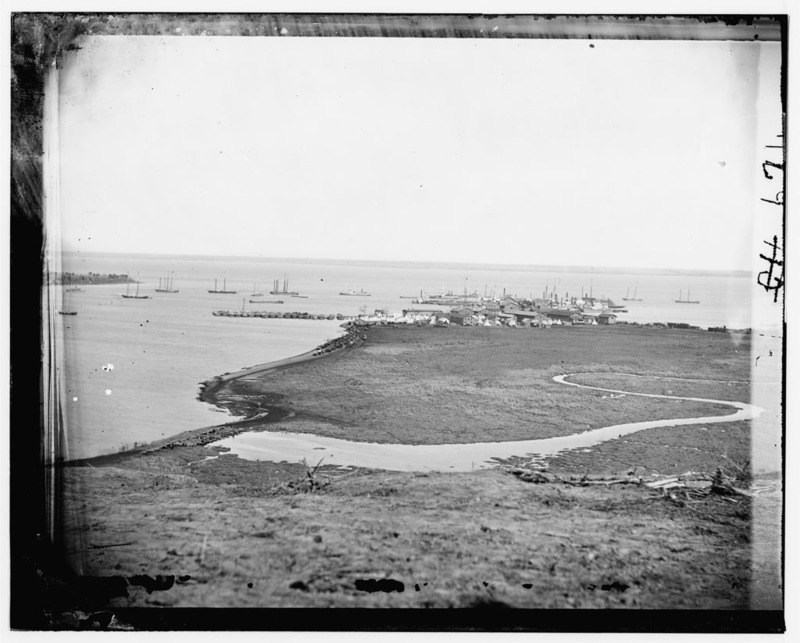 Both sides recognized the significance of Aquia Landing from the war’s very first days; Virginia seized the place on April 19, 1861, just two days after the ordinance of secession passed. Federal gunboats on the river watched closely, and within weeks reported the construction of new batteries to protect Aquia Landing. On May 31 and June 1, 1861, those gunboats would attack Aquia (without effect, as the Fredericksburg News trumpeted: “Attack at Aquia Creek—597 shots at us and ‘Nobody Hurt,’ except a Horse, a Chicken, and a Frog”). When the Federal army churned southward in the spring of 1862 and again in the fall, both times they turned Aquia Landing into the main Union base of supply. From there, trains shuttled tons of supplies every day over the RF&P line to stations at Brooke, Stoneman’s Switch, and Falmouth Station. In early 1863, Aquia processed and sent forward a million pounds of fodder every day for the 60,000 animals with the army. Here are a few images that illustrate the evolution of Aquia Landing from 1861 to 1863. We have no images that I know of prior to 1861, and none that show the landing destroyed in the aftermath of any of the army’s various uses (the facilities there were burned by the Confederates in 1861, by the Confederates again in March 1862, by the Federals in September 1862, and by the Confederates after the Union evacuation in June 1863). Nor do we have any post-war images prior to its abandonment by the RF&P in 1872, in favor of a single line direct through Quantico to Alexandria and Washington. 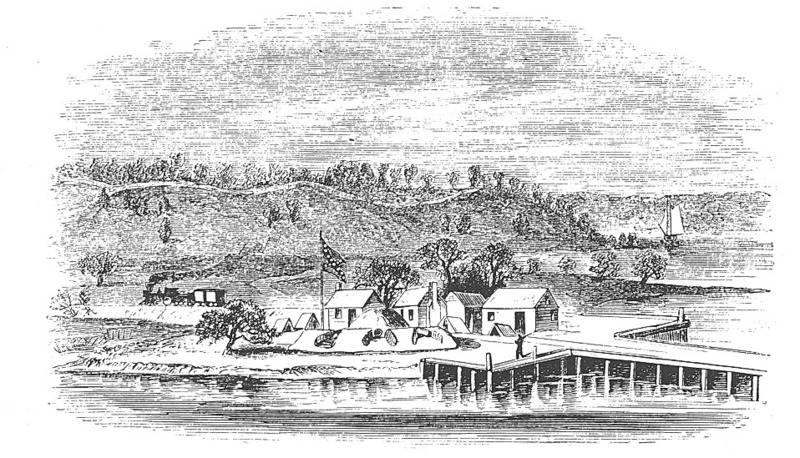 This is the earliest image of Aquia I have seen, showing the battery the Confederates built at the landing proper in 1861. This is clearly a retrospective view, since the Confederate battle flag shown in the image was not adopted until much later. Published in November, but surely showing the landing as it appeared in the summer of 1862. Drawn from the same perspective as some of the 1863 photographs. Note the bridge over the creek at left--the only real access to the landing for wagon trains. The nature of the ground (very marshy) and termination of the railroad ordained that the facilities at Aquia were tightly packed on the waterfront at the point. Note too that the only vehicular access was by a road to the point along the west side of the peninsula–with a bridge over the incoming creek. I include here too a blowup that gives a good sense of the density of buildings and facilities. Of all the places in the Fredericksburg region, I expect we will learn more about Aquia in the coming years more than anyplace else. Stafford County’s ABPP grant for archeological investigations and intensifying interest (and research) in the passage of escaped slaves through Aquia–these both portend a far greater understanding of the landscape in two years than we have today. ← Mystery: is there a locomotive in Aquia Creek?